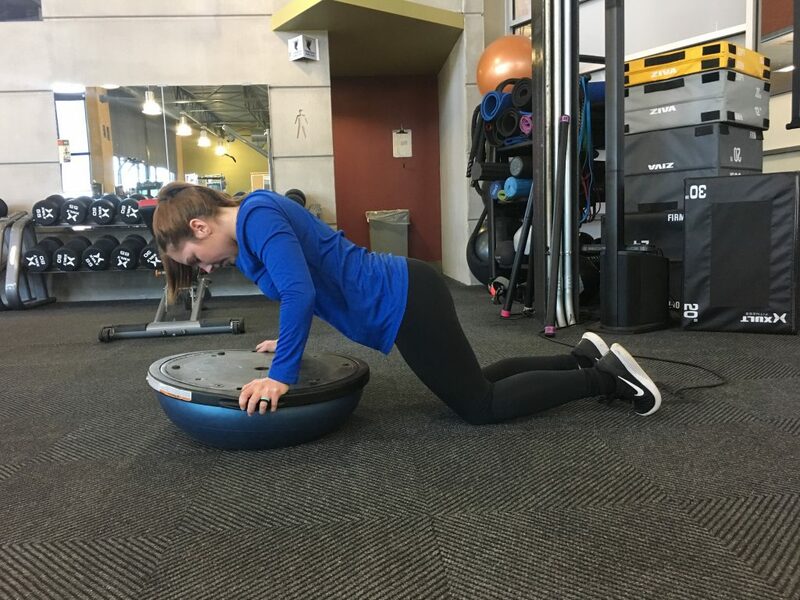 This bosu ball workout is made for any level fitness fanatic, whether you’re advanced or a beginner, you will find something here for you. 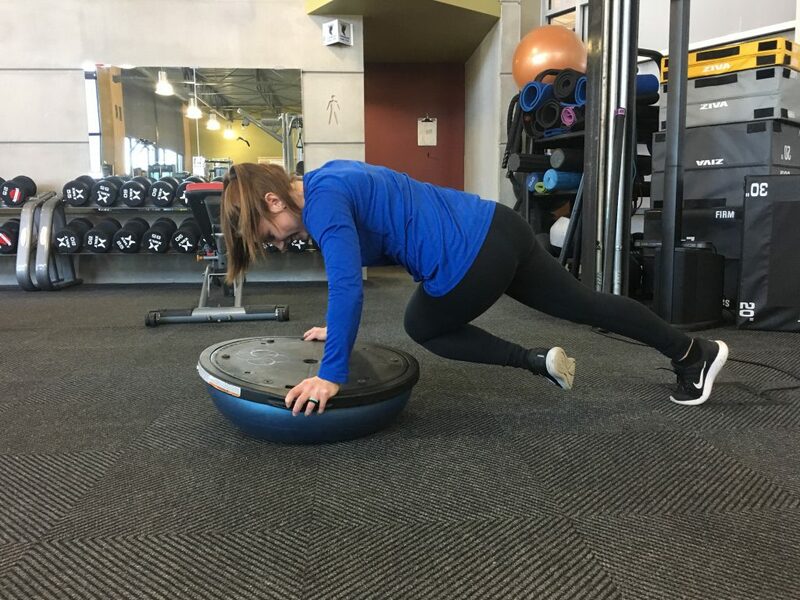 Bosu balls are a great piece of workout equipment because not only do they allow you to build strength, but they also create a way for you to work on your balance. 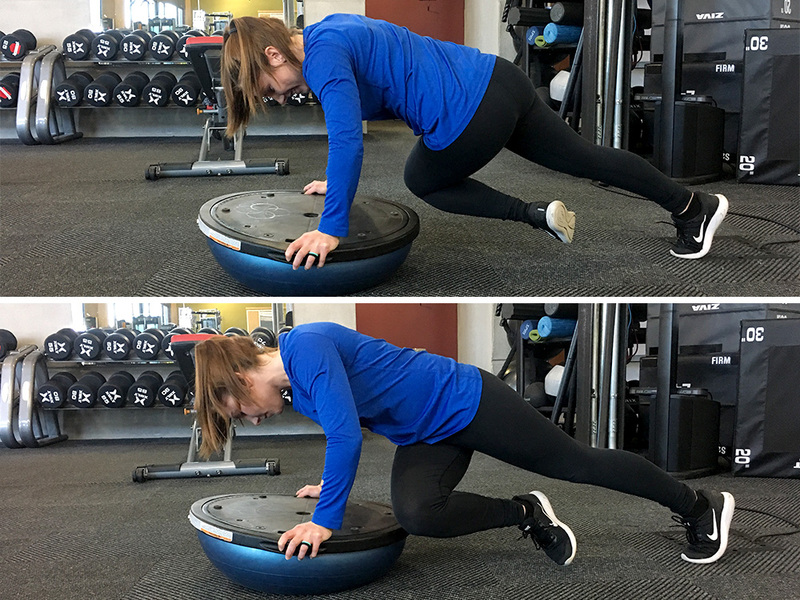 The bosu ball squat can be done on either side of the bosu ball. The squat is easier to do on the rounded side because the balance factor is less challenging. Step 1: Stand on either side of the bosu ball with your feet in line with your hips. Step 2: Slowly push the hips back as you lower down, making sure that your feet don’t cross over the toes. Step 3: Shift your hips back forward just to the point where you are back to a standing position. 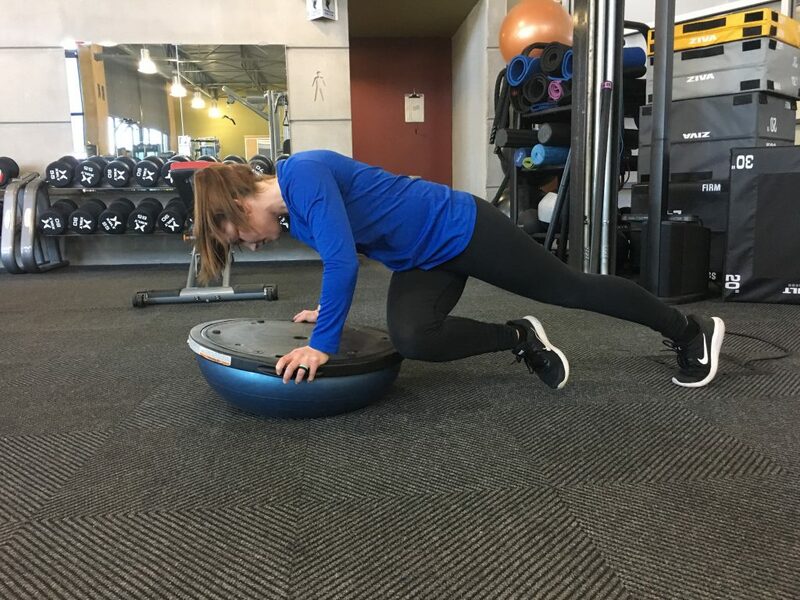 Step 1: With the rounded side of the bosu ball down, hold onto the outer edges of the bosu ball with your body extended out long. Make sure you have a straight line that you can draw from your head to your feet. Step 2: Your feet should be hip-width distance apart. Begin by bringing either leg to the middle of your chest, as far into the body as possible while maintaining a long spine. Step 3: Bring the forward leg back to meet the opposite leg and switch sides. To Modify: Use your core strength to bring your leg across the body to the opposite elbow, instead of up to the center of the chest. Step 1: Start in the same starting position as you did with the mountain climbers. Shift forward so that your wrists and shoulders are in line. 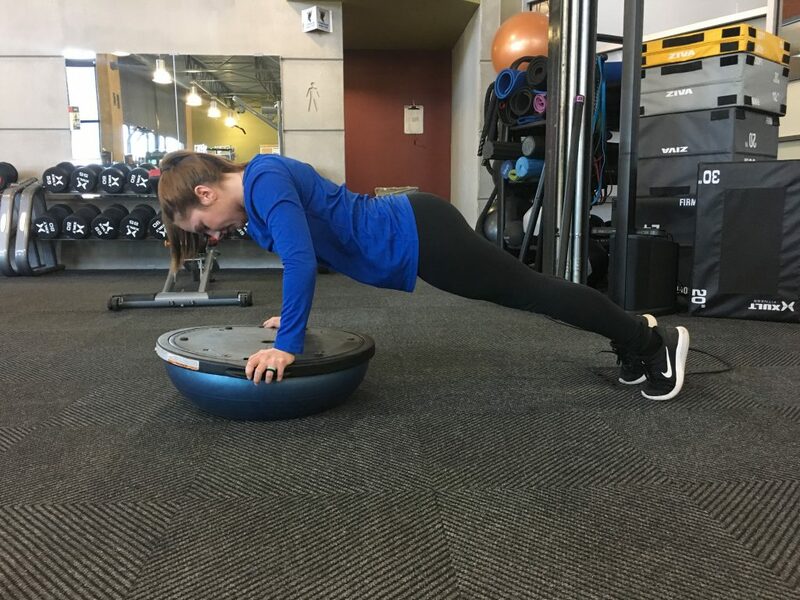 Step 2: Slowly lower down and pull the elbows into the body as you lower just to where your chest grazes the top of the bosu ball. Step 3: Use your chest and arm strength to push you back up to starting position. To Modify: Bring the knees down to the floor. Step 1: Start in the same starting position as you did with the mountain climbers and push-ups. Shift forward so that your wrists and shoulders are in line. Step 2: Continue to breathe as you lift the left leg, making sure that your form does not change. The hips should continue to face towards the floor. Step 3: Bring the left leg back down and lift the right leg, alternating back and forth. To Modify: Hold each leg up for 30 seconds, or come to your knees and hold the plank position for 30 seconds to 1 minute. 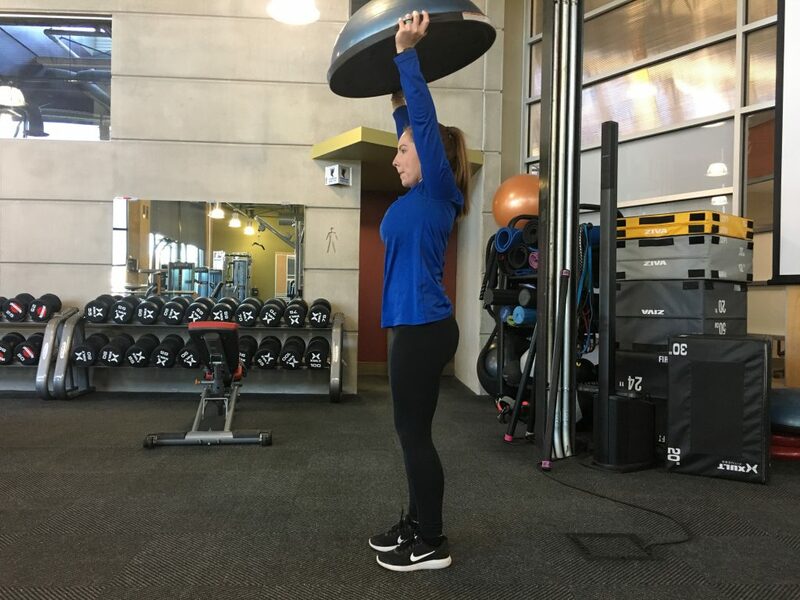 Step 1: Start in a standing position with the round side of the bosu ball up. The bosu ball should be sitting in front of your feet. Step 2: Reach down, shifting your hips back as you grab the bosu ball, and bring it up over your head. 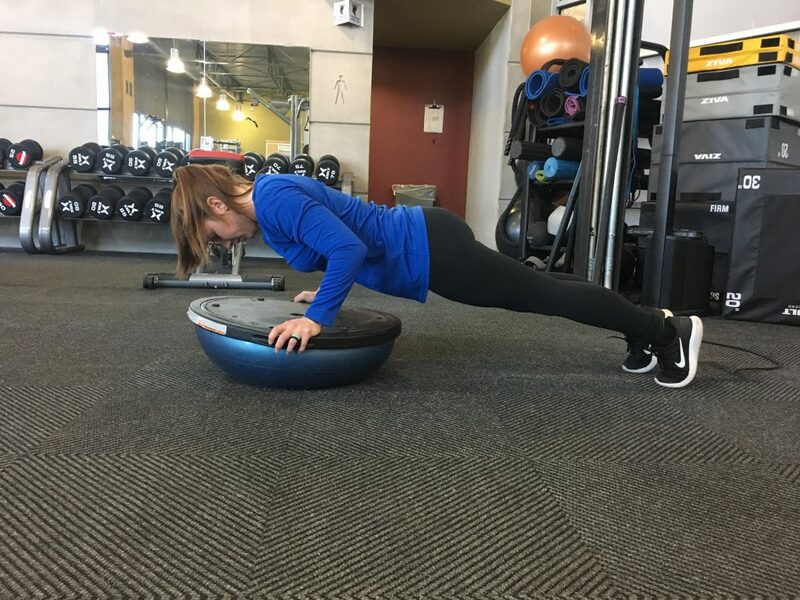 Step 3: Push the bosu ball over your head and bring it back down to the ground following the same body pattern as you did when you picked it up. Step 4: Jump your feet back so that your body is in a plank-like position while holding onto the bosu ball. Making sure that your feet are in line and your shoulders are in line with your wrists. Step 5: Tuck your elbows in towards the body as you lower down so that your chest grazes the top of the ball. Step 6: Push back up into plank-like position and repeat the exercise. To Modify: Take out the push-up, and/or step back instead of jump back into the plank position.